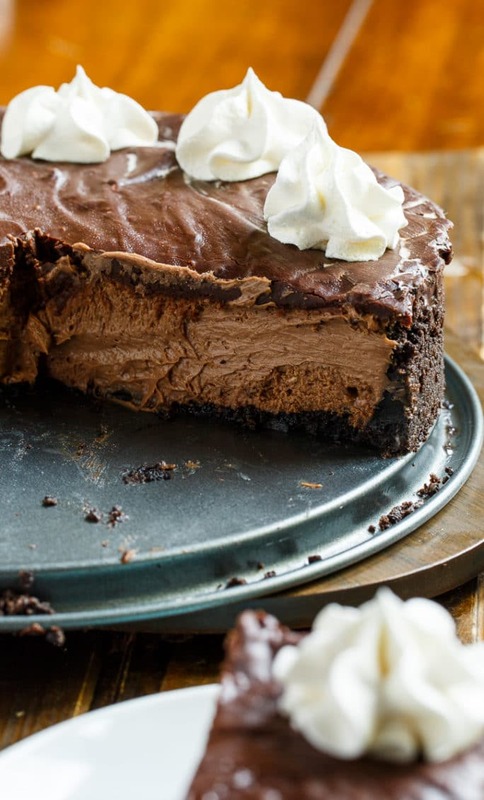 This Chocolate Cheesecake is just the thing to satisfy your chocolate cravings. Plenty of chocolaty flavor and just the right amount of sweetness. This creamy dessert is sure to impress. I think people tend to get a little intimidated by making cheesecakes. But once you’ve made one or two, they’re really quite simple. Since you make them in advance, they are perfect for holidays and get togethers. 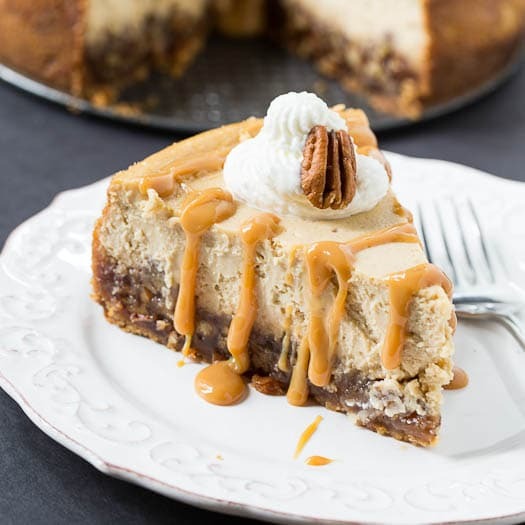 Cheesecakes are impressive enough for a formal occasion, but they taste so good, no one is going to complain if you bring one to a casual picnic or block party. 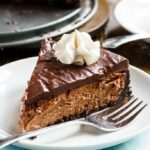 This Perfect Chocolate Cheesecake starts with an oreo crust and then a filling made from 2 kinds of chocolate- unsweetened cocoa powder and semi-sweet chocolate chips. There’s not too much sweetness in the batter and the tang of the cream cheese really shines through. I love to use Challenge Cream Cheese. It’s fresh taste and creamy texture really makes the difference. On top is a thick layer of chocolate ganache made from more semi-sweet chocolate. I like to serve each piece with a big dollop of whipped cream. Use food processor to turn cookies into crumbs or place cookies in a large plastic bag and smash with a rolling pin. Stir together cookie crumbs and melted butter in a medium bowl. Transfer into a greased 9-inch springform pan. Press crumbs into bottom and halfway up the sides. Place in 350 degree oven and bake for 8 minutes. Let cool while you make filling. Place 1/4 cup chocolate chips in a small bowl. Heat 1/4 cup heavy cream in a small bowl to just a simmer. Pour cream over chocolate chips. Let sit 2 minutes and then stir until smooth. Set aside. Using and electric mixer, beat cream cheese and sugar until smooth. Add eggs, one at a time, beating just until combined. Stir in vanilla and melted chocolate mixture. Pour batter onto crust. Place springform pan on a baking sheet and bake 45 to 50 minutes or until center jiggles just slightly. 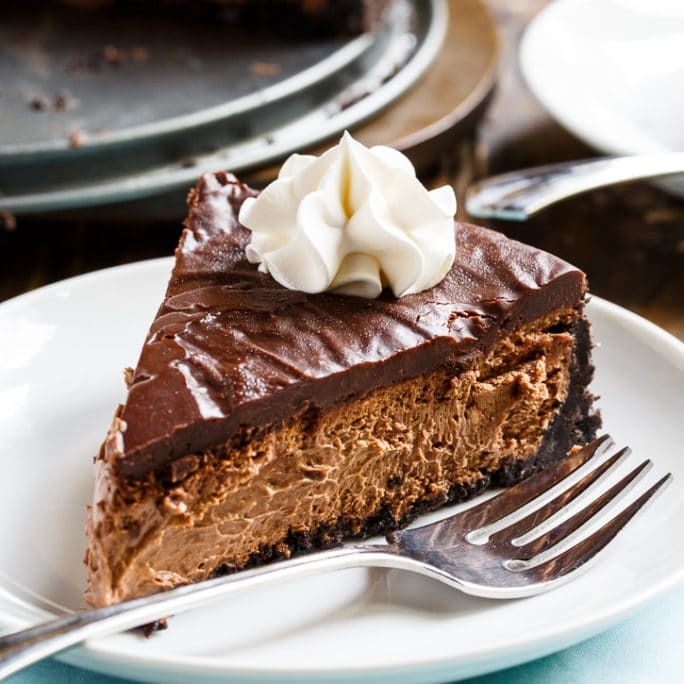 Cool cheesecake 10 minutes. Make topping. Place chocolate chips in a small bowl. Heat cream in a small saucepan just until it reaches a simmer. Pour over chocolate chips. Let sit 2 minutes. Add vanilla and stir until smooth. Spread over filling. Let sit 10 minutes. Run knife around edge of pan. Remove sides of pan. Let sit on counter to cool for 1 hour. Then refrigerate overnight. 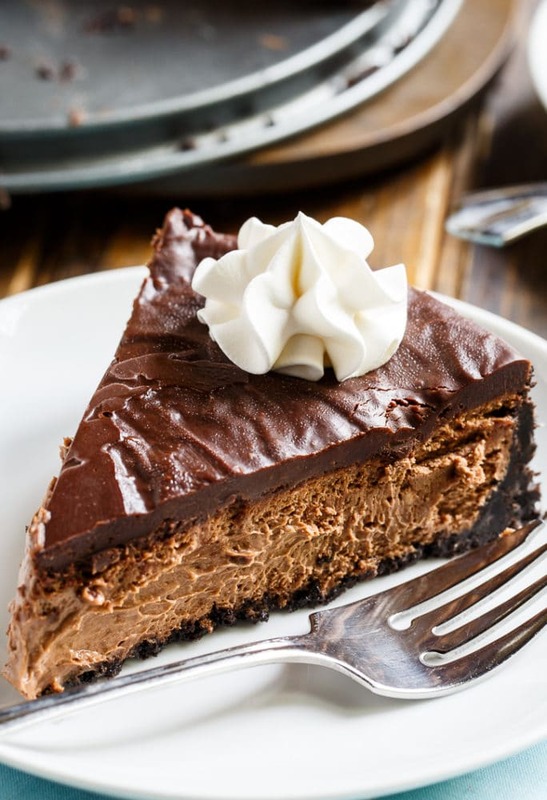 This entry was posted in Cakes, Desserts and tagged cheesecake, chocolate. Bookmark the permalink. Crockpot pecan pie posted on Facebook. Cannot find! Perfect really is the only word to describe this. Looks SO stinking amazing. Seriously, I need to try this before I drown in my own drool! Crazy delicious. I think those are the first words that come to mind upon seeing this. And I haven’t even tasted it yet. We eat with our eyes first – so you’ve done a fab job here! This must taste like heaven. Thanks for this recipe! 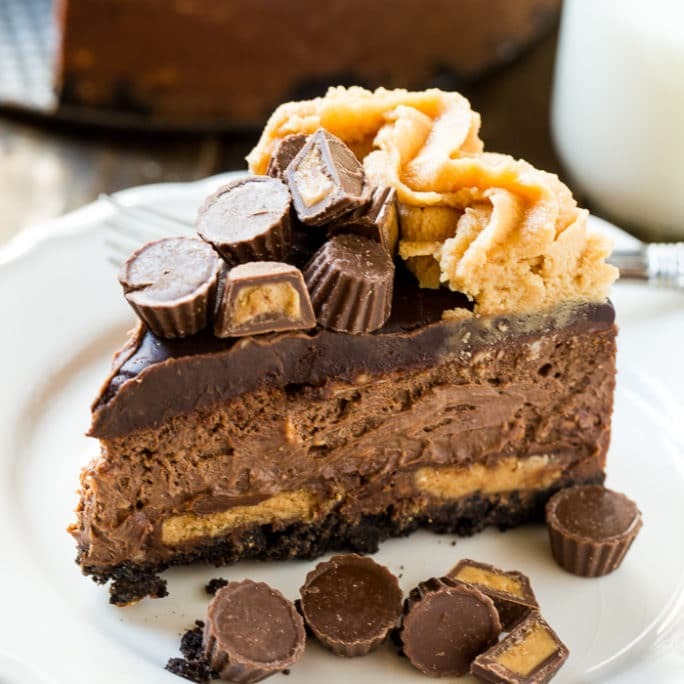 Oh this definitely looks like the perfect cheesecake! 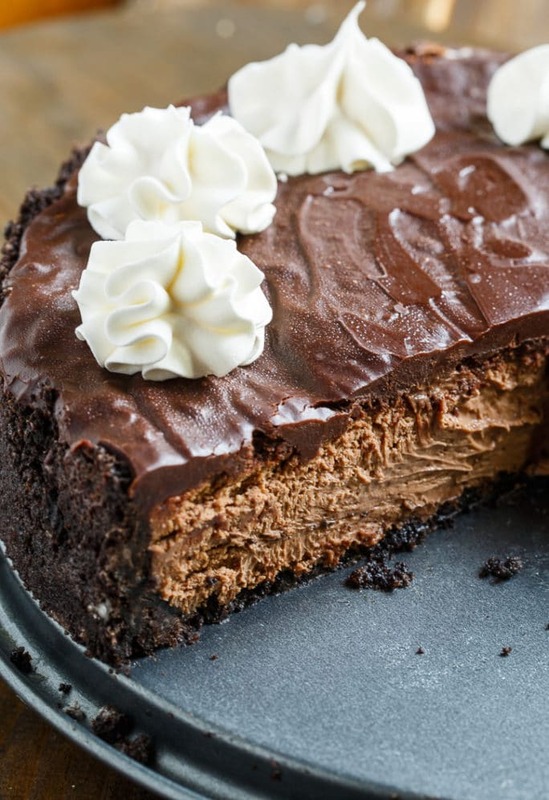 I’ve actually never made a chocolate version before, so I need to try this. Love that gorgeous topping, too! Oh yum!! these are amazing and the presentation is just as wonderful! amazing job!